22 Aug Filed under Brother Steven Visneau, Fine Art. 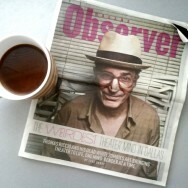 Cool portrait of Dallas theater director, Thomas Riccio, by SisterBrother photographer Steven Visneau. LOCATION : Former crack house on west side of hunt hill bridge SHOOT LENGTH : One Hour A few of Steven’s favorite outtakes below… Link to full article HERE.